After years of acclaim, the Hugo- and Nebula-award-winning Binti trilogy has been collected for the first time in an omnibus. Binti is a young Himba girl with the chance of a lifetime: to attend the prestigious Oomza University. Despite her family’s concerns, Binti’s talent for mathematics and her aptitude with astrolabes make her a prime candidate to undertake this interstellar journey. But everything changes when the jellyfish-like Meduse attack Binti’s spaceship, leaving her the only survivor. 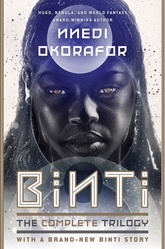 If Binti is to survive the rest of the voyage and save the inhabitants of the unsuspecting planet that houses Oomza Uni, it will take all of her talents to broker the peace. And this is just the beginning of Binti’s epic story.